Flying fish (Dactylopterus volitans) Illustration from pg. 5 of Robert Gouger's diary. Image courtesy of SLSA, PRG 1012/1. This morning the first mate found on the deck a flying fish which although somewhat injured in the tail afforded to our amateur artists an opportunity of trying their skill. The accompanying sketch I copied from a painting by Brown who among his other qualifications now turns out to be a very good artist. 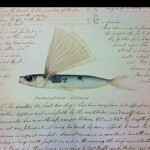 [Here follows a coloured drawing of the fish] The scientific name is Dactylopterus volitans. Some idea may be formed of the height the fish sometimes fly by this fish having been found upon the deck which is above the water about twelve feet. They generally however fly within two feet of the surface.